British taxpayers cannot be expected to protect Channel Island and Isle of Man savers, the UK's chancellor has said. 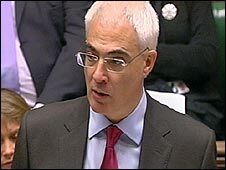 Alistair Darling said in his pre-Budget report the financial crisis highlighted needs for clarification over how Crown Dependencies protected depositors. He said he had asked for a review of any regulatory arrangements. The chief ministers of Jersey, Guernsey and the Isle of Man said they welcomed the review, adding it would show how open each financial system was. In his pre-Budget report to the House of Commons, Mr Darling said: "The recent financial turbulence has highlighted potential problems with overseas territories and crown dependencies, such as the Isle of Man and Channel Islands. "They attract banking customers with lower taxes - without contributing to the UK Exchequer. "But at times of stress, depositors need to know who will compensate them. "The British taxpayer, cannot be expected to be the guarantor of last resort. So I have asked for a review of these regulatory arrangements, which will report to me in the spring." Jersey's Chief Minister said he welcomed the review of the Crown Dependencies. Frank Walker said it would be a chance for the island to show the strength of its regulation system and the extent of its international co-operation and transparency. Guernsey Chief Minister Lyndon Trott said the island would "play a full and constructive role in the review". He said: "Financial services in Guernsey are well regulated and transparent, and have been recognised as such by the OECD, the Financial Action Task Force, and the Financial Stability Forum." The Isle of Man's chief minister, Tony Brown MHK, said the review was "understandable in terms of the turbulent economic climate being experienced around the globe". He said: "As far as the Isle of Man Government is concerned, we welcome this exercise as another opportunity to show that the island is well regulated, financially stable and internationally responsible."